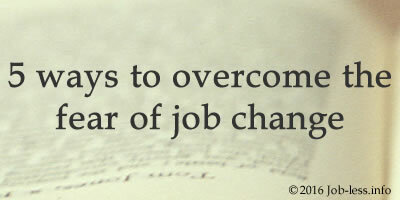 Article #1: 5 ways to overcome the fear of job change. If in your head more often appears a thought "I love my job, but...", it is no other than an intuition's signal that suggests you to think about changes. In this case, the overcoming fears is the main condition of success. 5 steps that should be done in such situation. Nothing is such an effective in decision-making as a change of scenery. Considering that probable change of work is a very serious step, means and your rest should be memorable too. Lack of holiday doesn't allow a brain to relax and work with greater force. When you change jobs, you should always be careful, not to act rashly, because there is a high probability that the new appointment hides "pitfalls". But also you shouldn't delay the final decision. As the psychologist Christophe Byurge claims, career is done by the one who plans changes, but doesn't decide to alter the work place owing to despair. He supplements, "The long-term stable appointment hardly assumes safety and confidence in the future, and on the contrary, it warns that in the present-day world lack of flexibility reduce your ranking in the labor market ". - the third should include all that you do on a daily basis in a professional matter. Compare all three lists, draw conclusions and act. From time to time look through the records, edit them - as a result, you will be able self-dependently to estimate as far you've come nearer or have moved away from own aims. - and what skills for this are necessary to possess. In off-duty time be engaged in searching of a new work - sending out resumes, go to the interviews, and ascertain your real chances. If your experience has unsuccessful change, the business coach Elena Pakhabeyan, who cooperates with the leading German companies, recommends without fail to highlight your strengths and achievements in the professional field. Did you also doubt after achieving new results then, in the past? No, but why are you still hesitating? Don't you have "sports passion" to achieve such a success again? Remember that the success, pleasure from work and self-realization - are achievable. But it is possible only in that case when your vocation coincides with the profession. And only then the source of the income develops into a source of personality's progress. In case your job and destination are "agreed", you will forget about "monotonous and boring work". So, ideally, work has to bring you satisfaction and joy.